I love stir fries with basil so when I saw this recipe on America's Test Kitchen I was almost sold. Almost because rather than using traditional Thai basil in Thai cooking (shocker isn't it? ), Cook's Illustrated substituted mint and cilantro because the two were much easier to find in the supermarket. Steven hates cilantro with a passion (he picks out every tiny piece from his pho) and I wasn't terribly keen about the mint-cilantro combo myself but luckily I have some Thai basil conveniently growing on the back porch so I was able to substitute that in a jiffy. Traditional Asian ingredients may be hard to come by so with that in mind, CI used brown sugar instead of palm sugar and jalapenos or serranos instead of Thai bird eye chilies (now these I don't have growing on the porch so I'm okay with this substitution). Even with the many departures from traditional Thai cooking, I was nevertheless happy with the recipe because it was very tasty and could be made in under 30 minutes, which is definitely a plus for a weeknight dinner. First trim the blade steak. There is a bit of silverskin along the outside of the blade steak that will need to be trimmed away. You'll also see in the picture that there is also a line of gristle that runs down the center of the steak. Cut the steak in half lengthwise to cut out the gristle. Then cut the meat against the grain into 1/4 in strips. Sprinkle the coriander, white pepper, brown sugar, and fish sauce over the beef and toss to combine, and let it sit for 15 minutes. Meanwhile, remove the ribs and seeds from the jalapenos and cut crosswise into 1/4 in pieces and roughly quarter the shallots. Mix fish sauce, rice vinegar, water, brown sugar, and chili paste in a small bowl. Heat 2 tsp of vegetable oil in a nonstick skillet or wok over high heat. Add a third of the beef and quickly distribute the strips in an even layer in the skillet. Cook until the beef is browned on the first side, about 2 minutes, without stirring then flip the pieces to the second side and cook until browned, about 30 seconds to a minute. Transfer the beef to a bowl. Add 2 more teaspoons of oil to the skillet and repeat the browning process twice more to cook the rest of the beef. After the beef is cooked, reduce the heat to medium, and add 2 more teaspoons of oil to the skillet. Add the jalapenos and shallots and cook, stirring frequently until they begin to soften, about 3 - 4 minutes. Add the garlic and cook until fragrant, about 10 - 15 seconds. Add the sauce to the skillet and increase the heat to medium high until the sauce is thickened. Add the beef and any juices back to the skillet and toss in the sauce. Take off the heat and stir in the Thai basil leaves. Serve over rice with chopped peanuts on top and lime wedges on the side. It looks so delicious that it wets my appetite ! Looks like a keeper to me, I second the Thai basil! I would have substituted regular basil for the thai basil as well, something about the cilantro mint combo just struck me as a little odd. I have to admit I'm terrible with beef too, tend to overcook it a lot. Blade steak has pretty good marbling so that helps it stay tender. How lucky! My local stores don't sell thai basil, I had to get mine from Pike Place. Thanks! Thai basil is great isn't it? 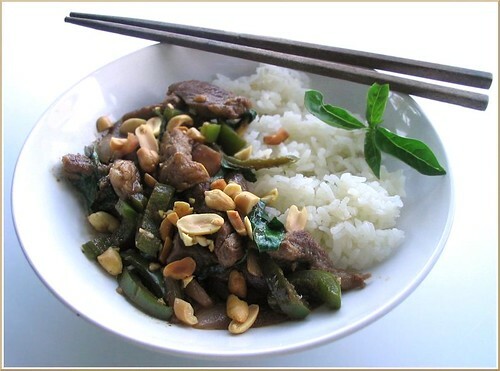 I love thai beef..plus thai basil...hmmmn so perfect with that rice. My garden is bursting with Thai basil so I think I need to make this! I have never tried stir frying with basil. It looks and sounds really good. I am going to have to try this. I love basil in just about anything, and I haven't had this dish in years! I should really order something like this next time I go to a Thai restaurant which I'm sure will be soon! Thanks! I love Thai basil and have some in a pot on my porch. Will have to give this recipe a try! Thai basil is fabulous isn't it? I just adore the smell. Definitely, my thai basil is my most precious plant! Let me know how you like it. Basil lends itself well to stir fries, as long as you add it in at the end. No problem! I'm with you on the basil. I saw a picture of your thai basil and it looked beautiful. oh wow, I'm trying this for sure...beef and basil, can imagine the combination!